A player who controls more permanents than each other player can't play lands or cast artifact, creature, or enchantment spells. That player may sacrifice a permanent for that player to ignore this effect until end of turn. 8/1/2008 A player affected by this card can sacrifice a permanent any time they could cast an instant. This is a special action that doesn’t use the stack and can’t be responded to. 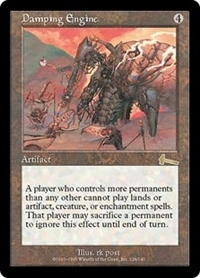 8/1/2008 A player can only sacrifice a permanent to end this effect if they have more permanents than any other player, and they haven’t already sacrificed a permanent to end the effect this turn. The ability to sacrifice a creature is granted by the same effect that is being ended.